We know coParenting can be hard. 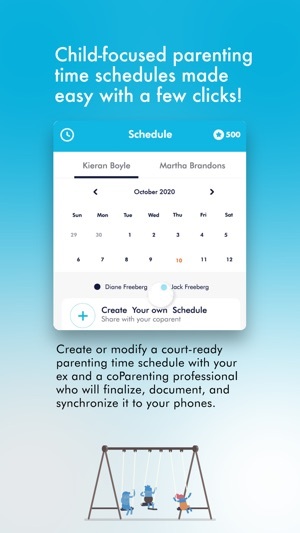 That’s why the coParenter app helps you save time, money, and stay out of court by helping you put your kids at the center, not in the middle. Download a FREE 30-day trial of the coParenter app and see how it helps you to effectively communicate with your coParent, to resolve disputes and help you focus on what’s important: being the best parent you can be. Safely communicate through the secure coParenting messaging tool, check in for pick ups and drop offs and manage your expenses between you and your coParent. And when things get hard, you can 'Get Help' from a live, unbiased coParenting Professional who can help you and your coParent resolve disputes, mediate agreements or provide you one-on-one coaching. - Agree on day-to-day coParenting decisions like haircuts, hygiene, diet, media, allowance, etc. We know coParenting can be hard; we're here to make it easier. Download the coParenter app today and get the support you need to put your kids at the center, not in the middle. Try it out with our FREE 30-day trial. Your coParenter subscription will automatically renew unless auto-renew is turned off at least 24 hours before the end of the current period. You can go to your iTunes Account settings to manage your subscription and turn off auto-renew. Account will be charged for renewal within 24-hours prior to the end of the current period. Your iTunes Account will be charged when the purchase is confirmed. This release addresses an issue affecting some users during registration. 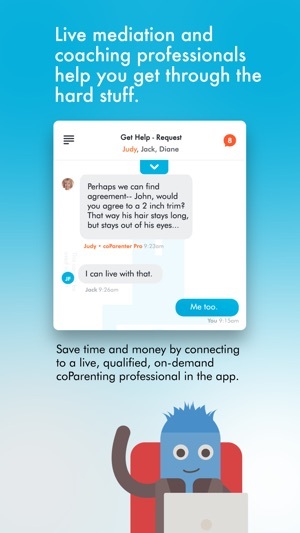 I have been using this app for 2 days and so far it has saved me thousands in attorneys fees, mediators, and therapy. The 3rd party was able to calm my ex down and have us come up w rules and boundaries that we both agreed to. Seriously, what took maybe a total of 2 hours solved a whole year of disagreements! I feel like my anxiety and depression were relieved over night! The worst part is that I wish this had been around years ago when I first got divorced. My life would probably be completely different, better late than never though!!! Only negative, and maybe I can’t figure it out, I wish there was a shared calendar that I could input things without a request being put in. Me we couldn’t co-parent via an app and this experience just proved him right! There is a red indicator telling me I have three messages but I can’t find them anywhere. I submitted a request for help and then the app locked me out for three days. When I was finally able to open the app there was only one message in the help section that read closed for duplicate. Then this morning I open it and there is another message saying closed for no response. I am not technically challenged. I manage application development for a living. At best this is not intuitive for the user. At worst it is just plain BROKEN! Co-parenting is stressful and you advertise as a useful, helpful tool and this has been detrimental. I love the user friendly interface of this app and the fact that I always have access to a mediator or professional when I need it! Easy to use and navigate. I especially love the Geo-check in feature when you pick up your kids and it gets logged. There are also many helpful articles written by professionals that are a quick read, but packed with very helpful do’s and dont’s regarding creating the best environment for your children during a very difficult time.